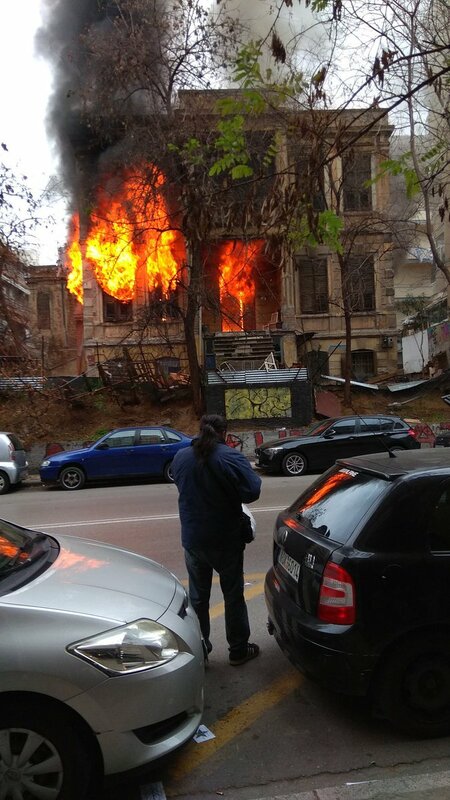 After a group of fascists had splitt off from a mass rally of nationalists and fascists, they attacked the squatted Libertatia social center in Thessaloniki, Greece. According to the cops around 100.000 people attended at the nationalist demo in Thessaloniki today, including many fascists. After the demo started under the statue of Alexander the Great, a large group of fascists attacked the social center “The School”. The cops didn’t stop the fascists during their attack against the social center School (video below). Anarchists repelled the fascist attack and the fascists had to retreat. The fascist thugs then went to the Libertatia squat, while cops blocked the anarchists that defended the social center School so they couldn’t get to Libertaria to defend it against attacks. A screen shot from the start of the attack against Livertatia from ERT TV (image below) shows that although cops stopped anarchists so they couldn’t defend the building, the cops did not nothing to stop the fascists. The right-wing and nationalist “Macedonia for Macedonia” campaign is a welcome opportunity for the fascist Golden Dawn Party and other fascist thugs to gain popularity again after their popularity declined a bit in the past few years. The “Macedonia for Macedonia” campaign demands that the former Yugoslavic Republic of Macedonia change its name into FYROM. Macedonia is also the name of the region in the north of Greece. Thessaloniki is the capital of the region. Nationalists in both countries are heating up the conflict. #Thessaloniki: Statement and Call for a Demo by #Libertatia Collective After Todays Fascist Attack | Enough is Enough! The demonstration gathered around 500 thousand people in Thessaloniki. This matter of the naming of FYROM is of great significance to most people in Greece. Saying it was a facist/nationalist demonstration is just plain propaganda. Most people there were everyday people, who want their voice heard by their government, which refuses to take a stance against the rewriting of ancient history that our northern neighbours use to justify their desired name for their country. The government of FYROM claim factually wrong things, like Ancient Macedonia not being a greek kingdom and being more like barbaric balkan conquerors. The issue is an issue between 2 nations and therefore no social issue. It’s a nationalist issue. When many people attend and March together with Golden Dawn thugs isn’t making it better, it’s making it worse. #Antifa Repelled Fascist Attacks in #Athens – Enough is Enough! Statement by #Libertatia Collective: “Our Will is to Keep the Space Occupied” – Enough is Enough! Report on the Nationalist Rally in #Athens – Enough is Enough! Fascists attack repelled at Free Social School in #Thessaloniki – Enough is Enough!